Get ahead of the competition by drawing on our expertise and harness the high-performance network of the future for Industry 4.0. The framework for our value chain is provided by networking all the elements involved in the value chain so that all relevant information is available in real time, and using the data to derive the optimum value adding stream at all times. Seamless data is the key to automated production processes. It is based on a virtual prototype with all the relevant information, ensuring the maximum possible efficiency at every point in your workflow. To ensure reliable translation into practice, our colleagues at Eplan have developed integrated engineering tools that reap benefits in your day-to-day work. The whole is more than the sum of its parts. It may sound simple, but this is actually an innovative process which constantly drives us to develop unique system solutions. 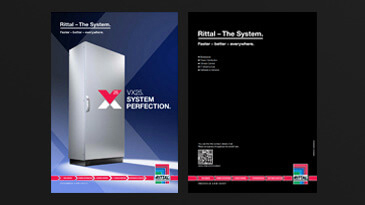 These system solutions offer clear user benefits, boost efficiency, and help our customers to raise their game. Interdisciplinary networking helps to strengthen digitisation and create added efficiency. 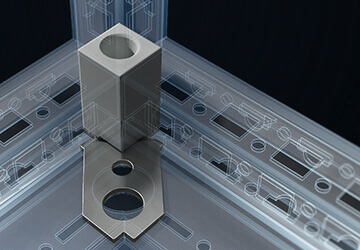 Seamless engineering tools, standardised system technology and automated machine tools create integrated value chains. In this way, we optimise processes in the workshop, create the basis for extensive automation, and boost your productivity. Fitted in a blink of an eye, the seal can be positioned precisely where needed and can be removed again at any time. The baying connectors are screwed into place in the baying direction to bring the enclosures safely into position. 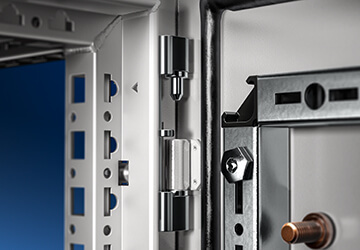 The baying connectors are designed so that all the baying scenarios that crop up in enclosure engineering can be covered with a maximum of just three different baying solutions. That means it is easier to make decisions and takes some of the hard work out of engineering. 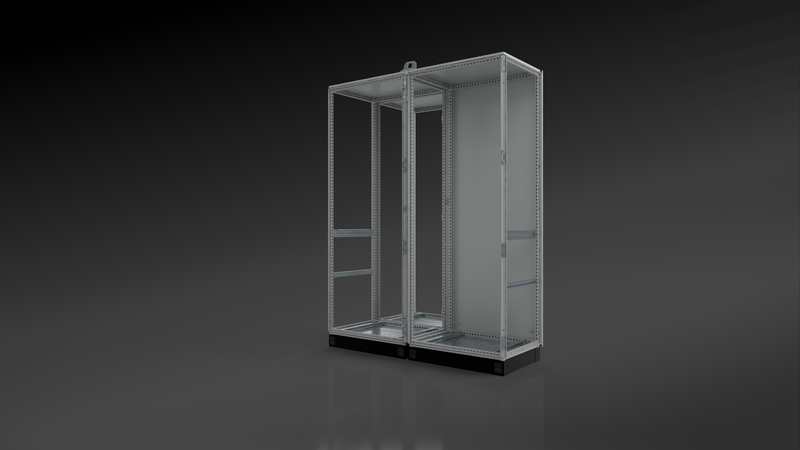 The option to bay enclosures on all four sides means users can adopt their own approach to tackling any imaginable space. Drive down complexity with simplified, more consistent baying technology for all applications. 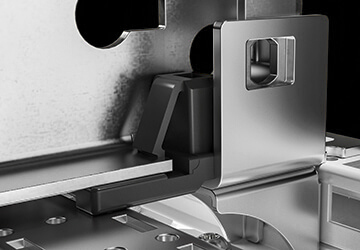 Thanks to its integrated clip, the mounting plate slide block can be easily removed and reinstalled without the need for tools, thus making work around the fully automatic machining process easier. 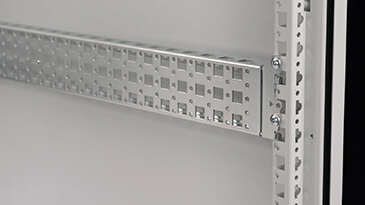 The practical mounting plate slide rail can be removed once the mounting plate has been inserted and reused at another position in the enclosure as a fully-fledged punched section. 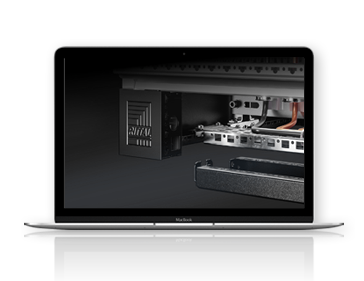 The option of using a special installation kit to install the mounting plate 20 mm deeper into the enclosure creates additional space in the depth of the enclosure. 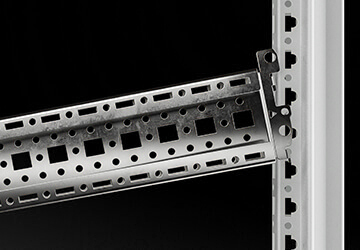 The clip at the top end of the mounting plate holds it in place during one-person assembly until the plate can be screwed into position. 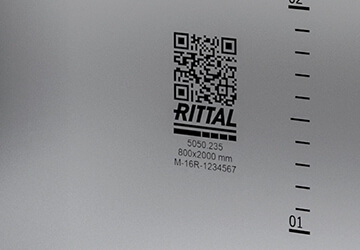 The QR code on all the panels that are to be machined simplifies their fully automatic incorporation into the production workflow and enables seamless, digital monitoring from goods receipt through to completion. More time savings, installation options and ease of assembly thanks to improved installation kits, including for dynamic loads. 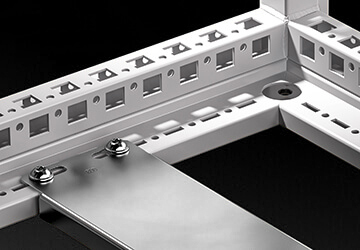 The punched sections feature an optimised mounting bracket and are simply screwed into place, which makes installation easier where space is limited and even supports retrofi tting. 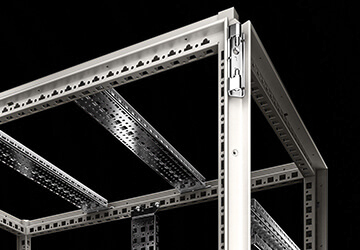 Using the standard punched section, including to support the roof and side panels, simplifies engineering and assembly, and relieves pressure on the parts warehouse. As both punched sections can be installed at the same height, there is more stability and strength at the inner and outer level, e.g. for heavy assemblies. 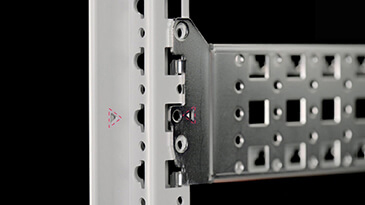 The frame profile allows users to install elements working through the profile from the outside, making it much easier to retrofit punched sections in places that can no longer be reached from the inside. 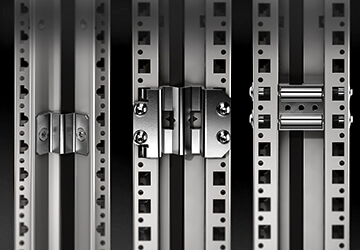 The frame profile, which is identical horizontally and vertically, enables consistent use of standardised punched sections and rails, which reduces the number of part variants by up to 40 per cent without losing any functionality. Thanks to its ingenious geometry, the patented special profile ensures excellent stability and torsional rigidity. The integral rain channel prevents the long-term build-up of moisture at the seal. 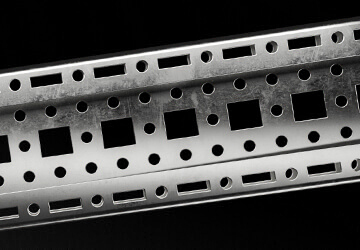 The special C-fold of the punched sections and rails creates an additional outer mounting level. 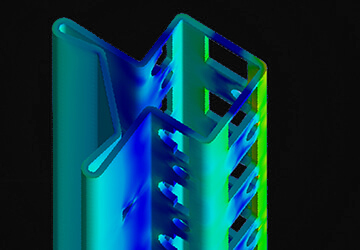 The continuous pattern of square punching supports the use of M6/M8 cage nuts and thus creates more mounting options at all profile levels. 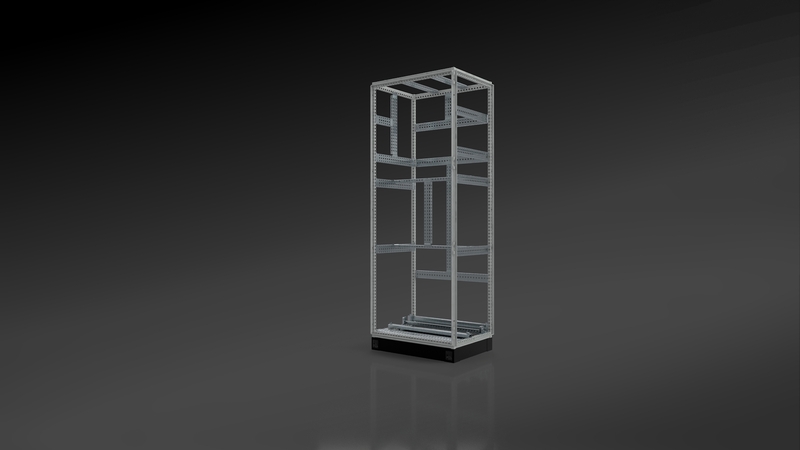 The corner piece with welded base frame makes it easier to create a fixing with the floor and base and improves stability. 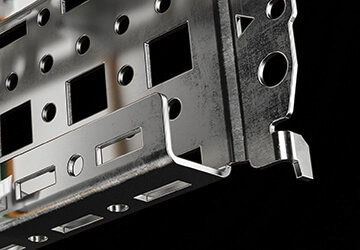 More assembly-friendly and efficient engineering thanks to a frame profile with a 25 mm pitch pattern that is symmetrical across all levels and can be accessed from all sides. 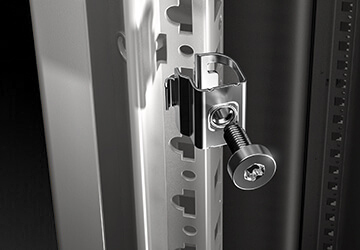 The flat centre seal does not obstruct the movement of the swing frame or other components. 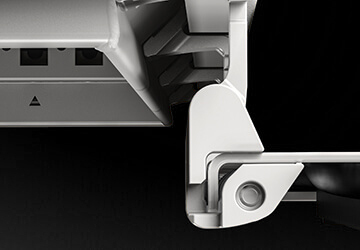 The panel holders can also be easily retrofitted and are clipped into place from the outside without having to first remove previously installed rear panels. 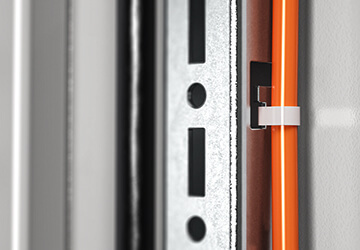 The series-standard T-head punching in the tubular door frame speeds up the process of laying cables in the door. 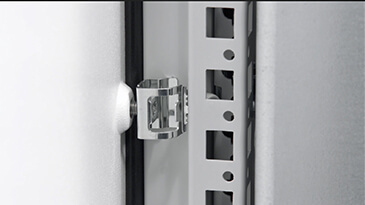 Cables can be fixed to the door extremely quickly, even when using conventional commercial cable ties. 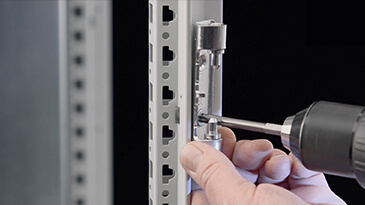 In the case of one-person assembly, the positioning aid for side and rear panels provides a user-friendly and ideally suited preliminary fixing so that the panels can then be screwed into place using both hands. 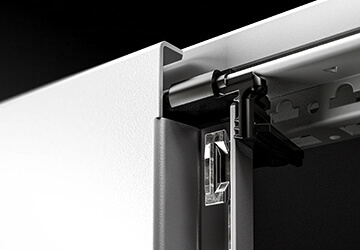 The innovative clip mechanism of the panel holders speeds up the installation of side panels. 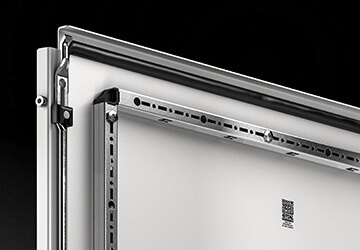 There is no need to machine the door when installing the 180° hinge, which reduces the installation time during retrofitting by up to 30 minutes per door. 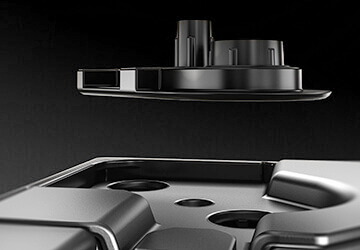 Thanks to its ingenious geometry, the special profile ensures excellent stability and torsional rigidity. 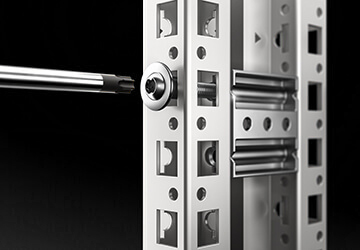 The simple, tool-free exchangeability of lock systems such as the comfort handle reduces the necessary installation time by up to 50 per cent. 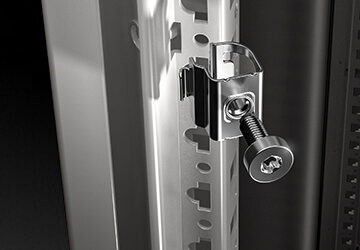 Thanks to the new hinge, doors can be installed and removed incredibly easily and without needing any tools, thus eliminating the need to separately lock and unlock hinge bolts. 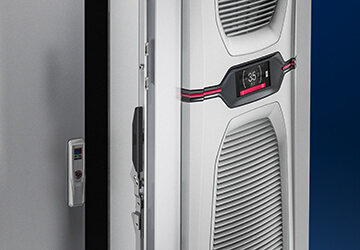 The opportunity to change the opening direction of main and adjacent doors on double-door enclosures according to needs, creates added flexibility when installing cooling units in enclosure doors and prevents collisions between equipment and doors. 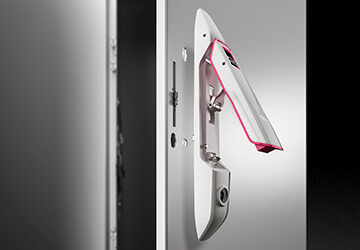 More flexibility, easier installation and better cost-efficiency thanks to ingenious hinge technology, fast-action interchangeable and installable closure technology and saving on machining processes. The simple screw fixing of the gland plates is quick to implement and also automatically creates potential equalisation in one single step. 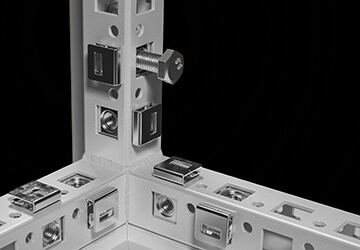 A direct screw connection between the base/plinth components and the enclosure automatically creates potential equalisation without having to incorporate any earth straps. 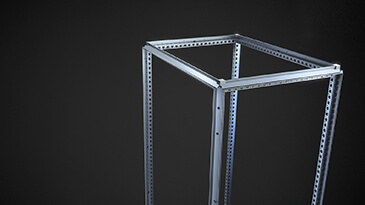 The large opening in the stable base frame makes it much easier to lay cables. 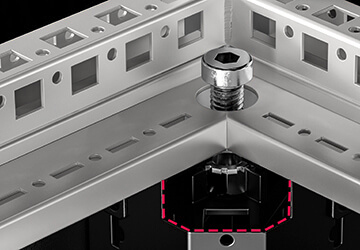 The centring aid for base/plinth mounting on the enclosure frame ensures the enclosure is positioned precisely on the base/plinth and also safeguards the IP protection category and frame protection when used without a base/plinth. Thanks to their series-standard marking, the earthing points help users easily find their bearings and speed up work. 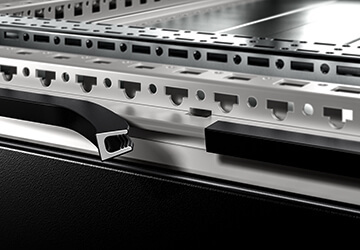 Thanks to rounded edges, cables routed under the enclosure are not at risk of being damaged. Enclosures can be fastened to the base/plinth or subsurface via either an M12 thread in the corner piece or the stable floor design. 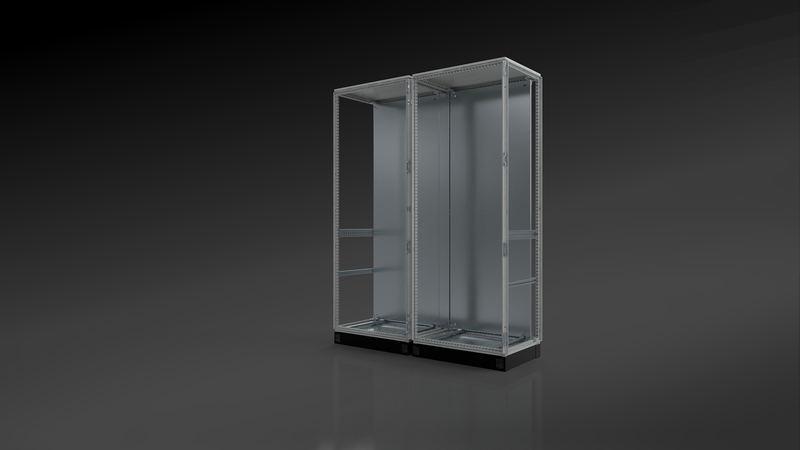 There are always two versions of this enclosure – real and digital. 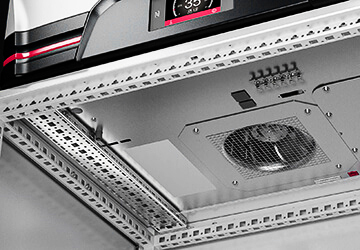 The maximum data quality of the VX25 ensures greater flexibility for configuration, manufacturing and assembly. And with the “digital twin”, the person who knows your company best – you – can plan, order, process and much more besides. This is thanks in particular to a frame profile with a 25 mm pitch pattern that is symmetrical across all levels. 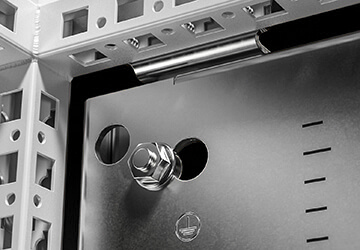 The VX25 is also accessible from all sides – even from the outside. Yet even though the options for expansion, mounting and baying are unlimited, it couldn’t be easier to use. This enclosure is especially good at saving time. 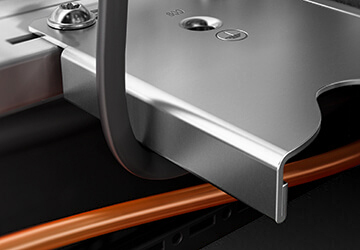 Because with its optimised access and even more comfortable assembly, the VX25 has also been constructed to allow partially tool-free assembly. 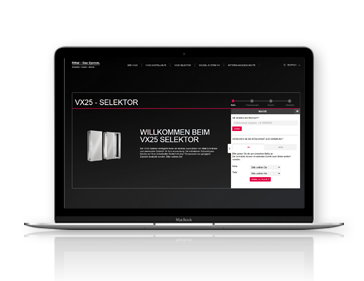 It means you can design your work processes even more easily, better and faster – and also more safely, by the way. Our videos show you how quick and easy it is to assemble the VX25 – making everything even quicker and easier. 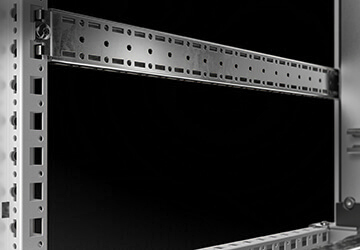 VX25 frame The frame profile enables a completely obstacle-free installation. 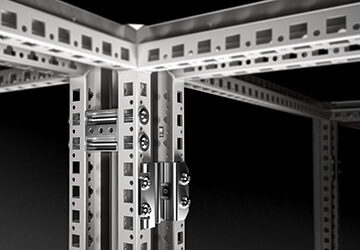 VX25 symmetry Horizontally and vertically identical frame section. 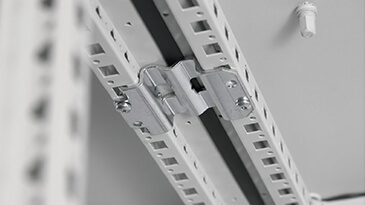 180° hinge 180° hinge reduces the installation time. 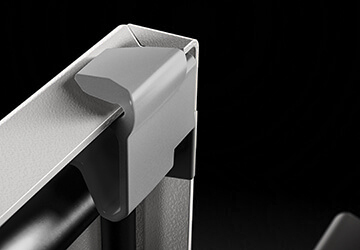 VX25 comfort handle Simple, tool-free exchangeability of the comfort handle. 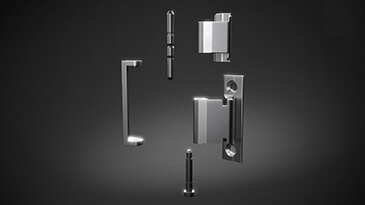 Swapping the door hinges With the hinge, doors can be installed and removed easily and without any tools. 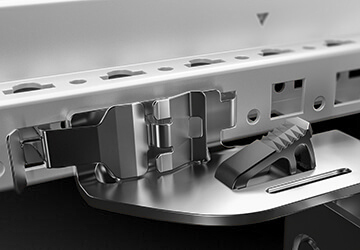 Simple mounting of the side panel Positioning aid for side and rear panels provides one-person assembly. Simple baying technology All baying scenarios can be covered with just three baying solutions. Mounting the punched section Learn about mounting the punched sections. 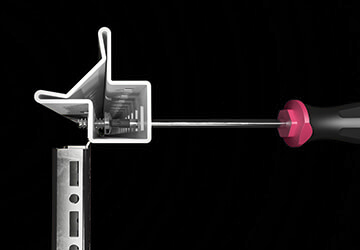 New integrated positioning aid Precise hole counting offers an easy point of orientation. 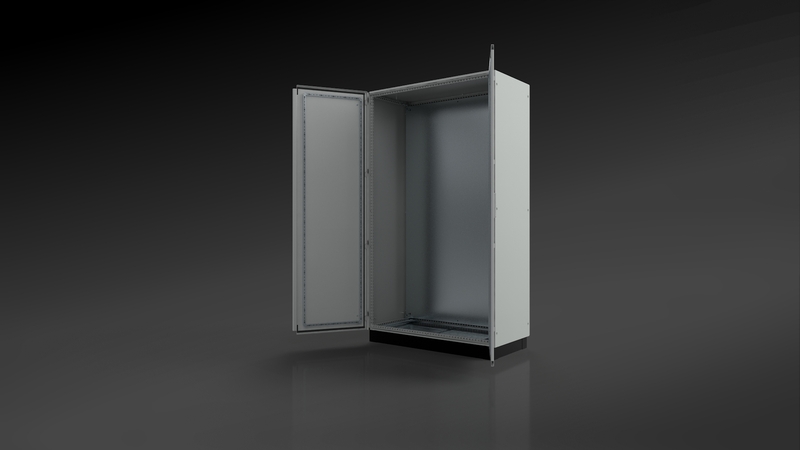 Our product catalogue has a full range of information about the new large enclosure system. 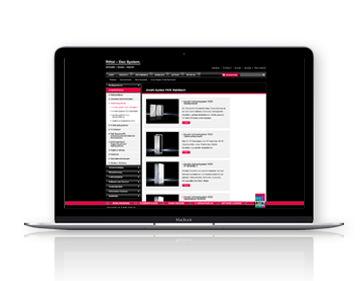 See our new base/plinth system VX for yourself. 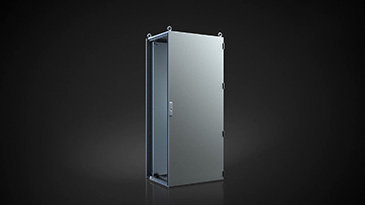 Any questions about the new VX25 large enclosure system? Then get in touch. 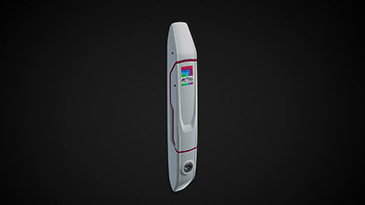 We’ll be only too happy to help you with any questions about the VX25. 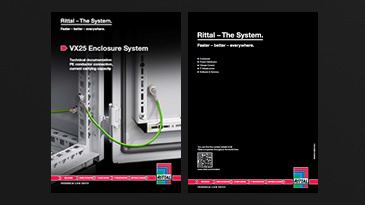 Yes, I consent to Rittal GmbH & Co. KG processing and using the data I provided on the form in accordance with Sections 15 ff of AktG (German Stock Corporation Law) to inform me by e-mail or post about system solutions relating to enclosures, power distribution, cooling and IT. 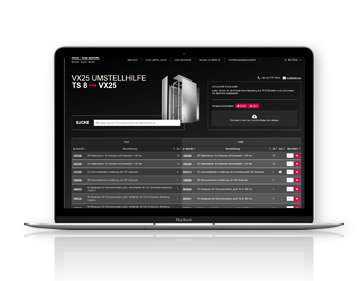 I can withdraw my consent with future effect and without having to state any reasons by sending an e-mail to info@rittal.de at any time without incurring any costs for this other than for sending the e-mail at the basic rate. This consent also applies to telephone calls. 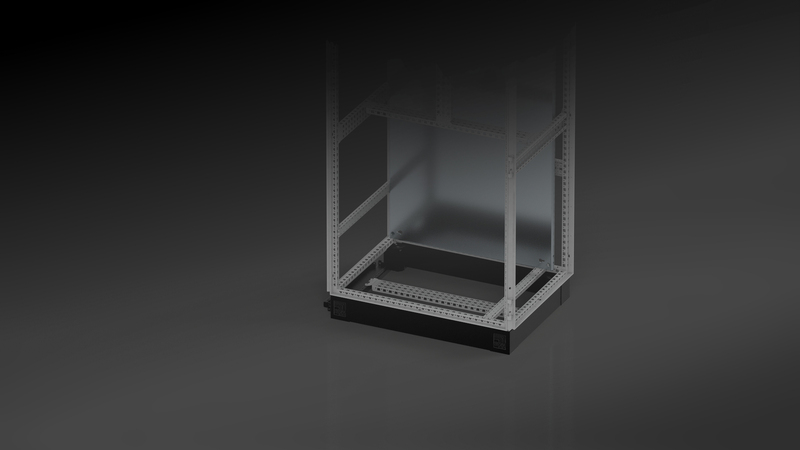 The new large enclosure system is not available in every country. Faster – better – everywhere. The whole is more than the sum of its parts. 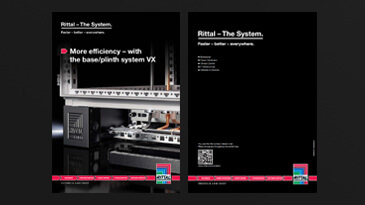 The same is true of 'Rittal – The System.' 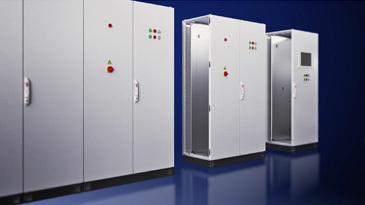 With this in mind, we have bundled our innovative products from the areas of enclosures, power distribution, climate control and IT infrastructure into one system platform for you. Supplemented with our extensive range of software tools and global service, we create unique added value for you.